We had such a full weekend with many proud moments, that I just needed to share it with you. 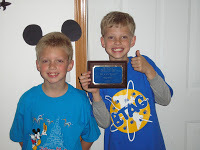 Friday morning, our son, Patrick was 1 of 20 to make the 3rd/4th grade spelling bee. When I realized that Patrick was in the top 4 kids who were left, I thought to myself, Wow, he made the top 4. Then before I knew it he was 1 of 2 kids left. The other boy, a 4th grader, misspelled the word “vertical” and Patrick spelled it correctly. He then correctly spelled “glorious” and WON THE SPELLING BEE! We were in shock! Of course, we know he is a smart cookie and a great speller, but didn’t think he would win! There were a few tears flowing from the eyes of this proud mama! 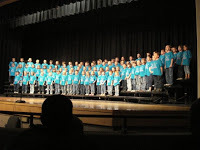 Friday evening was the annual elementary school progam. This program includes the K-2nd grade kids. Every year has a theme and this year it was Disney Magic. Our son Bennett did a great job singing and dancing to some of our Disney favorites. Saturday was our town-wide garage sales which I organize and also have one myself. So, getting all the maps and listings done by Friday morning to get copied and then get my own garage organzied and items marked and put out was my task most of the day Friday, after the spelling bee, of course. Saturday morning was a beautiful day with the sun shining. Many people came to town and found numerous bargains at 29 garages in town! My friend Emily and I hosted one in my garage and we were quite happy with our sales and the smaller amount of items to take back home! Of course I also had to shop at a few garage sales myself and the good thing is that I still came out ahead! Saturday evening we attended my husband’s sister’s church. She had been asked to give the message and we wanted to be there. It was a very uplifting message about doing our share to help others. God expects that of us and you can find His thoughts on this in MATTHEW 25. I appreciate Julie reminding us of Jesus’ expectations of us and the great needs of the sick and hungry in our communities! So, as you can see, I had a fabulous weekend. I am such a proud mom and I LOVE Spring. I am looking forward to the upcoming Mother’s Day Weekend and hoping for great weather. It doesn’t get much better than this! This is not the best video. The first couple words are hard to hear, but you can get the last two words that he spells and his reaction to it. It is priceless! ← A Guilt Free Week!